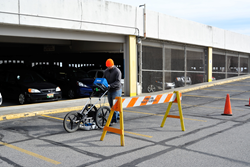 Infrasense, Inc., one of the leading subsurface detection firms in the nation, recently completed a ground penetrating radar (GPR) survey of an asphalt overlaid top level of parking structure in Portland, Maine. The objective of the survey was to quantify and map delaminated concrete for subsequent repair planning. Infrasense, Inc., one of the leading subsurface detection firms in the nation, recently completed a ground penetrating radar (GPR) survey of an asphalt overlaid top level of parking structure in Portland, Maine. The objective of the survey was to quantify and map delaminated concrete for subsequent repair planning. GPR was the preferred method due to its ability to measure the condition of the concrete deck without requiring removal of the asphalt overlay. Removing the overlay, which is required to effectively detect deck delaminations with traditional methods such as hammer sounding and chain drag, would have been costly and disruptive. GPR data were collected along 1-foot traverses covering the nearly 40,000 square foot survey area, resulting in over 1.7 million measurements used to create a deterioration map and quantity. Rainy weather occurring on the second day highlighted areas of potential concrete weakness, characterized by large saturated and dripping zones on the underside of the deck. A combination of the GPR and underside conditions maps produced targeted result that the client used to make design decisions. Nondestructive evaluation (NDE) uses a number of techniques to determine potential issues with materials or structural properties, without causing damage to the structure being evaluated. Because these techniques can be applied to a wide range of structures without any adverse effects, they have become a powerful decision-making tool. The type of structure and the condition to be detected dictates what NDE techniques will be most useful in a condition assessment. Ground penetrating radar (GPR) is an NDE technique that operates by transmitting short pulses of electromagnetic energy into the concrete, using a boxed antenna attached to a survey vehicle or rolled along the slab. These pulses are reflected back to the antenna providing a record of the properties and thicknesses of the layers within the slab. GPR has the ability to detect the depth and spacing of reinforcing steel, and the thickness of concrete slabs. It is able to detect subsurface deterioration of a slab through changes in the radar signal through the concrete. These results make GPR a useful tool in planning preventative maintenance and avoiding severe and costly structural issues down the road.